Online “answer engine” Wolfram Alpha and Cornify – a site that helps you paint rainbows and unicorns all over your virtual world – took top honors at the South By Southwest Web Awards on Sunday. Wolfram Alpha, which computes the answers to users’ questions instead of merely searching for existing sites, won both the award for Technical Achievement and the Best of Show judge’s pick. The awards were held as part of the South By Southwest Interactive Festival in Austin, Texas. All nominees were Web sites that were created or completely overhauled in 2009. Cornify, which bills itself as “the #1 unicorn and rainbow service worldwide, providing sparkles and happiness for all,” won the People’s Choice Award, based on online votes. Of course, being innovators in the online world didn’t spare the night’s nominees and winners from mockery by host, comedian Doug Benson. “I was told that the speeches would be short because many of the winners have never left their basement,” Benson said. For the record – all of the speeches were short (although, in fairness, the dozens of parties that dot the streets of Austin during SXSW had already started). Yay! So excited to be the People's Choice. The internet is about spreading happiness after all. Rainbows hugs! Hey, who took my Twinkies?? This has brightened my day. 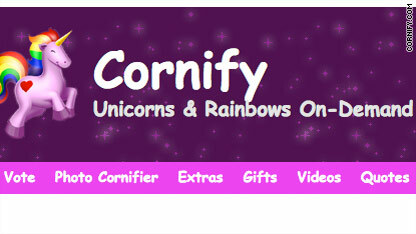 Goal accomplished cornify. Yay for rainbows and unicorns! Woohoo! You are in reality a good webmaster. The site loading velocity is incredible. It sort of feels that you are doing any distinctive trick. Moreover, The contents are masterpiece. you've done a magnificent task on this topic!